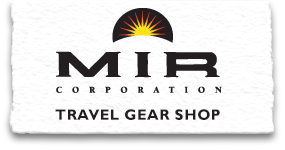 In this category you'll find everything from the perfect duffels made by Eagle Creek, to quick-drying shirts, to Marmot Fleece Jackets & hats, all of which can be embroidered with the handsome MIR logo. It is important to note that these items are custom embroidered at time of purchase, sales on all embroidered items are considered final. We invite you to call us to discuss any of the items and their sizing details, toll free at 1 888 924 2050 (+203 924 2050 outside North America). Please allow 3 weeks for delivery of embroidered items.